Added on September 1, 2017 by Sarah Simpson. During the past few months and as mentioned in a previous blog post, San Marcos City Council has been reviewing Code SMTX and proposed amendments to a January draft for final adoption. At a recent City Council amendments workshop, there was a sudden move to increase residential parking requirements in the downtown character district, fueled again by fear of changing the status quo. This decision was accompanied by a number of statements that conveyed uncertainty or confusion around parking reform issues, so I've compiled responses to some of these and provided them to City Council members in an effort to encourage them to return to the current parking minimums that apply to downtown. 1. It was asked if there are other towns and downtowns that have effectively implemented parking reductions. The answer is YES. And many have completely removed parking minimums in their downtowns or even across the entire city, with no sign of reversing this decision. 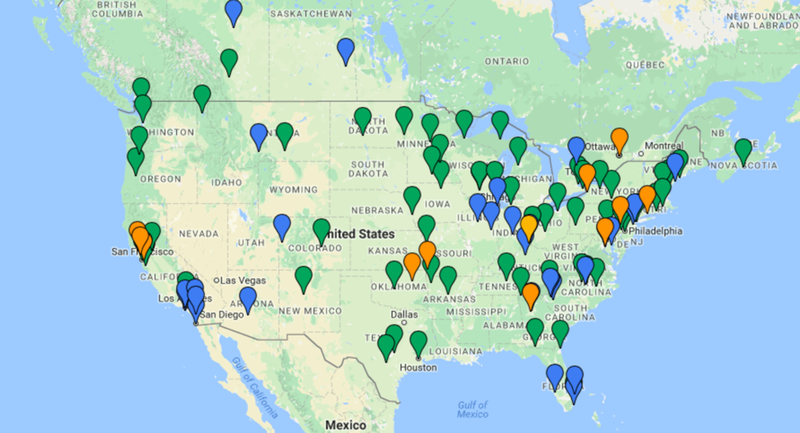 Above is a map published by Strong Towns (www.strongtowns.org) of towns that have eliminated parking minimums (green), reduced parking minimums (blue) or are discussing changing parking minimums (orange) as of the end of 2016. These towns range in population from very small - Spartanburg, South Carolina, population 38,000 - to medium - Buffalo, New York, population 256,000 which eliminated parking minimums throughout the entire City - to large, major cities. In some instances, these parking deregulation measures were enacted up to ten years ago and this map is growing as cities realize the benefits of a less car-centric development policy, particularly when coupled with other smart parking reform measures like metered on-street spaces and car sharing. Walking, biking and transit use measurably go up, and redevelopment that supports alternative transit and more housing is encouraged. 2. It was noted by a council member that with the current downtown parking minimum, some households that choose to live downtown may get rid of extra cars but would likely still have one car per household. It was then stated that a code that requires 0.75 parking space per bed would not provide sufficient parking for one-car households. However, it was not clarified that one household would occupy ONE UNIT - whereas the downtown code that currently requires 0.75 parking spaces is PER BED. At 0.75 spaces per bed, the downtown parking requirements would provide 1.5 spaces for a two bedroom household unit, 2.25 spaces for a three bedroom household unit, and so on. Parking PER BED is an issue in itself because by using a different unit of measure, it fails to recognize households with elderly or youth residents that do not drive, or couples or roommates that share cars. There are a diversity of households in the US, many of which would have less cars if parking was not provided in excess and the cost of parking was separated from rent. 3. It was noted by a council member that the cost of using car share apps, such as Uber, is expensive, and provided an example where this was costing someone $12 - $15 per day. However, the average yearly cost of car ownership far exceeds the daily expense with shared transit. AAA's most recent 2017 study (http://newsroom.aaa.com/auto/your-driving-costs/) shows that when factoring initial cost, yearly maintenance, repair, insurance, depreciation and fuel costs, it costs on average $8,469 annually to own a car in the United States. But if someone spent $15 every day of the year using Uber, a bus pass, or other car share programs, this would amount to $5,475, a net savings to that individual of about $3,000 a year. Furthermore, studies show that the more an individual utilizes modes of shared transit, the more likely they are to also use public transit, own less cars and spend less on transportation overall (https://www.apta.com/resources/reportsandpublications/Documents/APTA-Shared-Mobility.pdf). When people realize they can save money, habits do change - and the success of making San Marcos a multimodal community is all about changing a person's mindset and raising awareness of the cost and health benefits of moving beyond private car use. 4. Higher standards for stormwater BMPs that exceeded staff's technical and researched recommendations were adopted, requiring extremely high standards where none have been in place since San Marcos' founding. However, there was no discussion of how to help encourage the development community to reach for this higher standard, which has a high probability of negatively impacting the creation of new housing, both affordable and market rate in San Marcos and instead lead to increased sprawl outside the city limits where there are less restrictions on water quality.